Local in jack pine plains and sandy prairie-like areas; calcareous flats along Lake Huron; limestone outcrops; fens and calcareous river banks; rock crevices and ledges on Lake Superior. This species was long placed in the broadly construed genus Aster, which it resembles in the numerous, long, and white rays compared with those of the other flat-topped goldenrods. It hybridizes with typical goldenrods, not with true asters. Hybrids with S. ohioensis [S. ×krotkovii B. Boivin] occur rarely where the two species grow together, e.g., on Drummond Island (Chippewa Co.), along the Escanaba River (Delta Co.), and at Thompson's Harbor (Presque Isle Co.) First-generation hybrids are recognizable in the field because of the pale yellow or cream-colored rays. 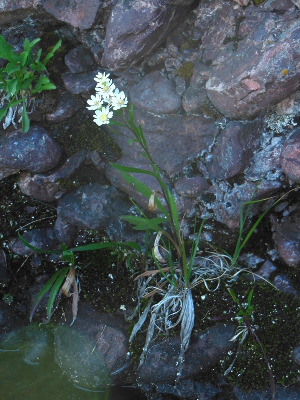 Such plants may resemble S. houghtonii; however, the rays are not only paler, but also more numerous and/or longer; the pedicels may be smooth and glabrous, scabrous, or rough-hispidulous. Some intermediates appear closer to one presumed parent and some to the other; backcrossing can be suspected. MICHIGAN FLORA ONLINE. A. A. Reznicek, E. G. Voss, & B. S. Walters. February 2011. University of Michigan. Web. April 19, 2019. https://michiganflora.net/species.aspx?id=464.